One of Indonesia's biggest department store, Metro, is now holding a Big Sale promo. Unlike last year, the window display looks so ordinary and nothing special, for me. However, there is a very interesting window display of it I saw at Mall Taman Anggrek. It occupies only a very small space and located in a corner where there are very few passers-by. Beyond this limitation, the display is actually a very great one. It carries the core message about shopping that can make people shop more and more. 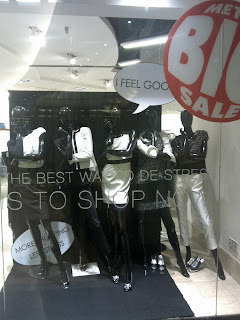 There are five black-colored female mannequins in black and white outfit posing behind a writing in the glass window 'The Best Way to De-stress is to Shop Now'. 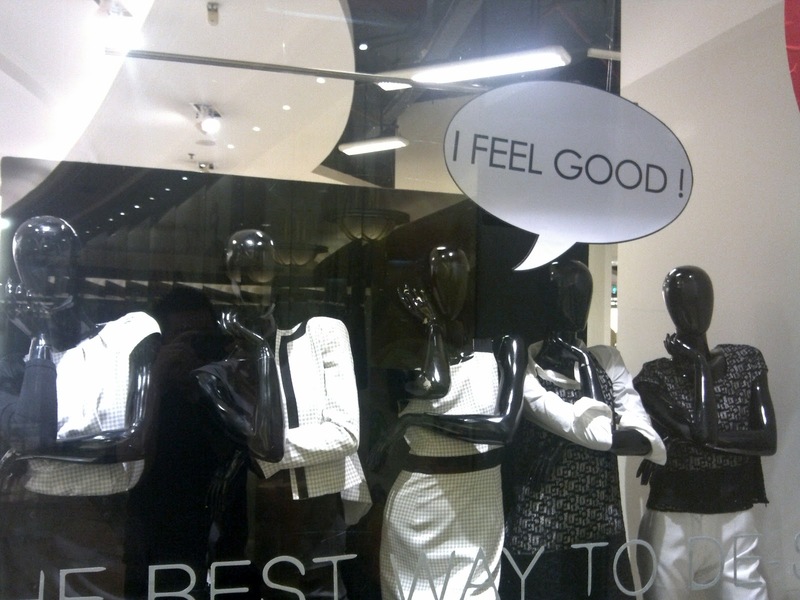 One of the mannequins has a bubble mind above its head that reads 'I feel good'.